Today’s Coffee Spot, Ue Coffee Roasters True Artisan Café & Store, in Witney, has the longest name of any coffee shop I’ve visited. Ue is, to my knowledge, the UK’s only wood-fired roaster, a rare breed which includes Speckled Ax in Portland (Maine). I first came across Ue back in 2014, when I visited Oxford for a feature in Caffeine Magazine. Based in nearby Witney, I came out to see the roastery, but back then there wasn’t much of a coffee scene in the town itself. Fast forward 3+ years and how things have changed. Witney boasts several places worthy of a visit, including Eden Café and Coffeesmith, which were joined, in December 2016, by Ue’s True Artisan Café & Store. 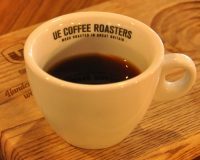 Unsurprisingly, the café serves as a showcase for Ue’s considerable output, with a house-blend and guest on espresso, and multiple single-origins (eight while I was there) on filter, through Aeropress, Chemex or V60. There’s also a range of loose-leaf tea from sister company Jeeves & Jericho, with a selection of sausage rolls and cake if you’re hungry. All of the coffee and tea, plus loads of gear, is available to buy, which covers the “store” part of the name. This is the first of two (for now) Ue coffee shops in Witney, with the second recently opening on Market Square at the town’s southern end. In contrast, the True Artisan Café & Store is all the way at the other end of town, at the High Street’s northern end (perhaps a five-minute walk if you stop to admire the views along the way). You’ll find it on the east side of the street, a large square window on the left, door on the right, a single bench on the pavement beneath the window. The café is long and thin, with a high ceiling. A four-person window-bar runs the full width of the window, while the glorious counter’s on the right, set back a little from the door. Opposite, long rows of retail shelves, running floor-to-ceiling, disappear into the distance, giving way to more seating at the back. An L-shaped bench runs along the left-hand wall from shelving’s end to the back wall, then along the back wall, stopping only for a door in the back right-hand corner. There are three two-person tables on the left, with two four-person tables at the back. The only other seating is at the counter’s far end, two barstools letting you perch to watch the pour-overs being made. Almost everything is wood, including the counter, furniture, floorboards and the right-hand wall. The exceptions are the left-hand wall, which is plastered, and the walls around the seating, which is exposed brick. The counter itself is gorgeous, running maybe three-quarters of the length of the café, with a curved section at the front, holding the cake/food. Then comes the till, followed by the two espresso grinders and the La Marzocco Strada espresso machine. Finally, at the back is the EK-43 grinder for the filter coffee and retail sales, followed by the pour-over area. Another curve at the back provides the spot for the two stools. This really is a great place to sit and chat with the friendly baristas and watch the coffee being made. While there is plenty of natural light at the front, the lighting at the back, where most of the seating is, can best be described as subdued, giving it a very cosy feel. In fact, with the exposed brick and copious amounts of wood, it could have been designed with me in mind! Since this was Ue, I challenged my barista, Edwin, to surprise me. Without missing a beat, he suggested a Chemex of the Ethiopian Aramo, which he described as one of the sweetest coffees he’d ever had. As beans, it smelled amazingly sweet and it was beautifully presented, on a wooden tray, served in a carafe with a cup on the side, complete with glass of distilled water. Initially I was a little disappointed, since the coffee wasn’t as sweet in the cup, but once I had accepted it for what it was, rather than what I’d expected it to be, it really grew on me. Evolving and improving as it cooled, it was a very rich, intense, fruity coffee. Edwin used a relatively short ratio of water to coffee (12:1) with a long brew time (4½ minutes). After discussing this with me, Edwin made me another Chemex, this time using a coarser grind to achieve a three-minute brew time. The result, while recognisably the same coffee, was sweeter but thinner. While I enjoyed it, I preferred the first one. However, it too evolved and improved as it cooled, to the point where I preferred it over the first one when it was cool. Wonderful, complex stuff, coffee. December 2017: Ue Coffee Roasters True Artisan Café & Store was a runner-up for the 2017 Best Physical Space Award. This entry was posted in Cafe/Roaster, Cake, Coffee Shops, Laptop Friendly, Retailers, Witney and tagged include by Brian Williams. Bookmark the permalink.